Although it still seems newfangled to many homeowners, radiant floor heating has not only been around for a while, but it also offers an attractive combination of comfort and savings. Most people assume radiant floor heating costs a fortune. Perhaps that’s because, compared with radiator or baseboard heat, radiant systems are rare. But there’s reason to suppose that in the years to come, radiant heating may enjoy much greater popularity, at least in new construction or homes undergoing renovation, because of its potential to save homeowners money on monthly heating bills. According to a recent study conducted by Kansas State University in conjunction with the American Society of Heating, Refrigerating and Air-Conditioning Engineers (ASHRAE), a radiant system can operate 25 percent more efficiently than a forced-air system. So in a sense, the technology benefits from being the new kid on the block, as it seeks to improve in areas where traditional systems stumble. Heat loss occurs through uninsulated walls, attic, or basement space, and also through gaps in windows and around exterior door frames. In traditional heating systems, heat loss can also occur within the system itself, with heat dissipating on the journey between its source (i.e., the furnace) and the home’s conditioned space. In a forced-air system, such heat loss occurs most of all in ductwork, where even misaligned joints can leak to a considerable degree. To maintain a comfortable indoor temperature, therefore, the furnace must work harder and consume more energy to make up for the lost heat. With radiant heat, heat loss isn’t an issue, so you don’t have to pay for the system to work overtime. If you’ve ever walked into a heated room, you know that it’s warmest directly next to the radiator, baseboard, or heating vent. The farther you venture from the unit, the more likely you’ll feel the need to turn up the thermostat. By contrast, radiant flooring does not create pockets of warm and cool air; it distributes warmth evenly across the entire room. Neither too hot nor too cold, you remain comfortable enough to leave the thermostat in the money-saving range. Another advantage of even heat distribution: You can place furniture wherever you want, instead of carefully arranging things around the radiators, baseboards, or vents. In other words, radiant heat allows for design freedom, whereas many traditional systems place limits on your options. Not every radiant heating system maximizes homeowner savings. 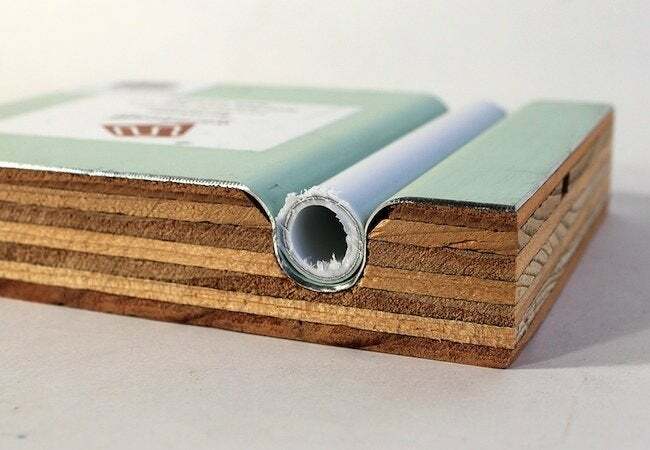 Yes, the system design alone, no matter the individual components, offers advantages. But the individual components in a radiant system can make a big difference too—and that’s where the products offered by different manufacturers begin to diverge. In a typical radiant heat setup, hydronic tubes (or electric coils) are embedded within a slab of gypsum concrete, a material that, in its sluggishness, is not perfectly suited to home heating. First of all, it takes a long time to heat up, and homeowners tend not to appreciate the wait. Second, concrete very slowly releases any heat it has gained, so if a homeowner decides the temperature has risen too high, his quickest, most effective recourse is to open the windows to bring down the temperature. That doesn’t sound so terrible, but where savings are concerned in home heating, efficiency counts—and opening windows in winter is the opposite of efficiency! 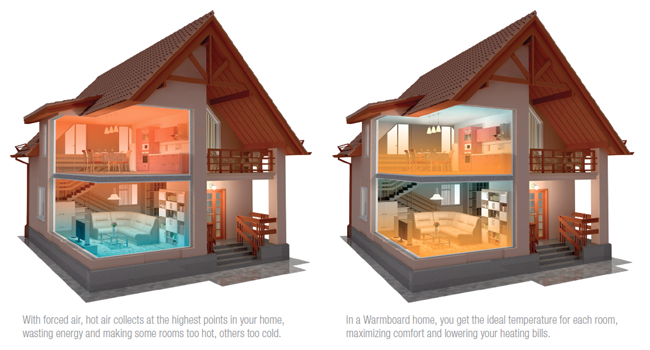 Warmboard offers innovative hydronic radiant heat panels that hinge not on concrete, but on highly conductive aluminum. Conductivity translates into savings in two ways. First, because the aluminum so effectively transfers heat from the hydronic tubes in the panels to the living spaces in your home, the boiler can heat the water to a lower temperature than other systems would require. Second, you can turn the thermostat down—for instance, when you go to sleep for the night—and when you raise the heat upon waking up, the change registers in minutes. There’s nothing new about adjusting the thermostat, when possible, to save money. 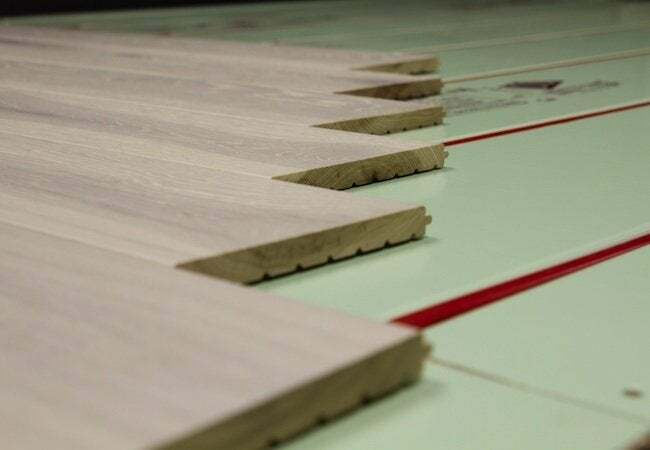 But unlike many of its competitors, Warmboard lets you capitalize on the latest energy-efficient technology without forcing you to sacrifice tried-and-true methods.